Comet 96P/Machholz or 96P/Machholz 1 is a short-period sungrazing comet discovered on May 12, 1986, by amateur astronomer Donald Machholz on Loma Prieta peak, in central California using 130 millimetres (5.1 in) binoculars. On June 6, 1986, 96P/Machholz passed 0.40373 AU (60,397,000 km; 37,529,000 mi) from the Earth. 96P/Machholz last came to perihelion on October 27, 2017, and will next come to perihelion on January 31, 2023. 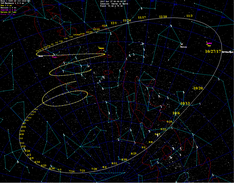 The comet has an estimated diameter of around 6.4 km (4.0 mi). 96P/Machholz is unusual among comets in several respects. 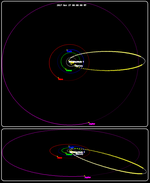 Its highly eccentric 5.29 year orbit has the smallest perihelion distance known among numbered/regular short-period comets, bringing it considerably closer to the Sun than the orbit of Mercury. It is also the only known short-period comet with both high orbital inclination and high eccentricity. In 2007, 96P/Machholz was found to be both carbon-depleted and cyanogen-depleted, a chemical composition nearly unique among comets with known compositions. The chemical composition implies a different and possible extrasolar origin. The orbit of 96P/Machholz corresponds to the Arietids and the Marsden and Kracht comet groups. Its Tisserand parameter with respect to Jupiter, TJ, is 1.94 and comets are generally classified as Jupiter family if TJ > 2. Orbital integrations indicate that TJ was greater than 2 about 2500 years ago. 96P/Machholz is currently in a 9:4 orbital resonance with Jupiter. It will not make another close approach to the Earth until 2028, when it will pass at a distance of 0.31972 AU (47,829,000 km; 29,720,000 mi). It may eventually be ejected from the Solar System. The name of the comet was created by examining the orbital period, which was less than 5.3 years. 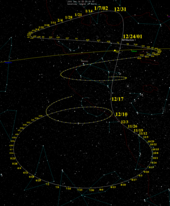 Among finding 96P/Machholz, it was discovered that it was also traveling in a parabolic path curving around the sun. Machholz 1 entered the field of view of the orbiting Solar and Heliospheric Observatory (SOHO) in 1996, 2002, 2007, 2012, and 2017, where it was seen by the corona-observing LASCO instrument in its C2 and C3 coronagraphs. During the 2001/2002 passage the comet brightened to magnitude −2, and was very impressive as seen by SOHO. In 2007, it appeared in SOHO's LASCO C3's field of view from April 2 to 6, peaking in brightness on April 4, 2007, around magnitude +2. In these observations, its coma was substantially smaller than the Sun in volume, but the forward scattering of light made the comet appear significantly brighter. Between July 12–17, 2012, 96P/Machholz was visible in the SOHO LASCO/C3 field of view and expected to brighten to about magnitude +2. Two small faint fragments of 96P/Machholz were detected in the SOHO C2 images. The fragments were five hours ahead of 96P/Machholz, and probably fragmented from the comet during the 2007 perihelion passage. The orbit of Machholz 1 passes just outside Jupiter and inside the orbit of Mercury. The 2017 perihelion was on October 27, 2017. At closest approach, it passed 0.12395 AU (18,543,000 km; 11,522,000 mi) from the sun. Coronagraphs on SOHO were monitoring the flyby for a fifth time. Its peak brightness was expected to be about 2.0, when it was closest to the Sun. Spectrographic analysis of the coma of 96P/Machholz was made during its 2007 apparition, as part of the Lowell Observatory comet composition long-term observing program. When compared with the measured abundances of five molecular species in the comae of the other 150 comets in their database, these measurements showed 96P/Machholz to have far fewer carbon molecules. These other comets had on average 72 times as much cyanogen as 96P/Machholz. The only comet previously seen with similar depletion both in carbon-chain molecules and cyanogens is C/1988 Y1 (Yanaka), but it has a substantially different orbit. There are currently three hypotheses to explain the chemical composition of 96P/Machholz. One hypothesis for the difference is that 96P/Machholz was an interstellar comet from outside the Solar System and was captured by the Sun. Other possibilities are that it formed in an extremely cold region of the Solar System (such that most carbon gets trapped in other molecules). Given how close it approaches the Sun at perihelion, repeated baking by the Sun may have stripped most of its cyanogen. ^ "JPL Small-Body Database Browser: 96P/Machholz 1" (Epoch: September 6, 2013). Jet Propulsion Laboratory. Retrieved December 6, 2014. ^ a b c d e "96P/Machholz Orbit". Minor Planet Center. Retrieved December 11, 2017. ^ a b c Kronk, Gary W. "96P/Machholz 1". Cometography. Archived from the original on July 5, 2008. Retrieved August 6, 2008. ^ "Don Machholz and Comet 96P". Astronomy.com. March 29, 2007. Retrieved August 6, 2008. ^ a b "96P/Machholz 1". JPL Small-Body Database Browser (Epoch: September 6, 2013). Retrieved December 6, 2014. ^ a b c d e f Schleicher, David G. (2008). "The Extremely Anomalous Molecular Abundances of Comet 96P/MACHHOLZ 1 from Narrowband Photometry". The Astronomical Journal. 136 (5): 2204–2213. Bibcode:2008AJ....136.2204S. doi:10.1088/0004-6256/136/5/2204. ^ "IAU Circular 8842". International Astronomical Union. June 6, 2007. Retrieved July 5, 2011. ^ Langland-Shula, Laura E.; Smith, Graeme H. (2007). "The Unusual Spectrum of Comet 96P/Machholz". The Astrophysical Journal Letters. 664 (2): L119–L122. arXiv:0706.2022. Bibcode:2007ApJ...664L.119L. doi:10.1086/520839. ^ a b MacRobert, Alan (December 2, 2008). "A Very Oddball Comet". Sky & Telescope. Retrieved December 5, 2008. ^ Katsuhito, Ohtsuka; Nakano, Syuichi; Yohikawa, Makoto (February 2003). "On the Association among Periodic Comet 96P/Machholz, Arietids, the Marsden Comet Group, and the Kracht Comet Group". Publications of the Astronomical Society of Japan. 55 (1): 321–324. Bibcode:2003PASJ...55..321O. doi:10.1093/pasj/55.1.321. ^ de la Fuente Marcos, Carlos; de la Fuente Marcos, Raúl; Aarseth, Sverre J. (21 November 2014). "Flipping minor bodies: what comet 96P/Machholz 1 can tell us about the orbital evolution of extreme trans-Neptunian objects and the production of near-Earth objects on retrograde orbits". Monthly Notices of the Royal Astronomical Society. 446 (2): 1867–187. arXiv:1410.6307. Bibcode:2015MNRAS.446.1867D. doi:10.1093/mnras/stu2230. ^ a b Green, Daniel W. E.; Rickman, Hans; Porter, Alain C.; Meech, Karen J. (1990-03-02). "The Strange Periodic Comet Machholz". Science. 247 (4946): 1063–1067. Bibcode:1990Sci...247.1063G. doi:10.1126/science.247.4946.1063. ISSN 0036-8075. PMID 17800064. ^ Boschat, Mike (January 7, 2002). "Comet 96P/Machholz now in the SOHO C3 images". Meteorobs.org. Archived from the original on July 6, 2008. Retrieved August 6, 2008. ^ Yoshida, Seiichi (May 29, 2007). "96P/Machholz 1 (2002)". Aerith.net. Retrieved February 3, 2012. ^ "Exclusive Views of Comet 96P/Machholz". Solar and Heliospheric Observatory. NASA. January 6–10, 2002. Retrieved February 3, 2012. ^ Yoshida, Seiichi (September 20, 2007). "96P/Machholz 1 (2007)". Aerith.net. Archived from the original on August 29, 2008. Retrieved August 6, 2008. ^ Marcus, Joseph C. (April 2007). "Forward-Scattering Enhancement of Comet Brightness. I. Background and Model". International Comet Quarterly. 29 (2): 39–66. Bibcode:2007ICQ....29...39M. ^ Kusiak, Michal. "Transits of Objects through the LASCO/C3 field of view (FOV) in 2012". Sungrazer Project. United States Navy. Retrieved February 1, 2012. ^ a b Battams, Karl (July 16, 2012). "Breaking News: Comet Machholz had babies!!". Sungrazer Project. United States Navy. Retrieved July 16, 2012. ^ "SOHO Pick of the Week". ^ "A New Compositional Class of Comets: from Fire, Ice, or Beyond? Lowell Observatory Astronomer Confirms New Class of Comets" (Press release). Lowell Observatory. December 2, 2008. Retrieved December 5, 2008. ^ Fink, Uwe (September 1992). "Comet Yanaka (1988r): A New Class of Carbon-Poor Comet". Science. 257 (5078): 1926–9. Bibcode:1992Sci...257.1926F. doi:10.1126/science.257.5078.1926. PMID 17753496. ^ Bryner, Jeanna (December 2, 2008). "Odd Comet Possibly from Another Star System". Space.com. Wikimedia Commons has media related to 96P/Machholz.